India is situated at tropical latitudes and has diverse temperature and rainfall regimes. The overall climate of India is suitable for the growth of forests. 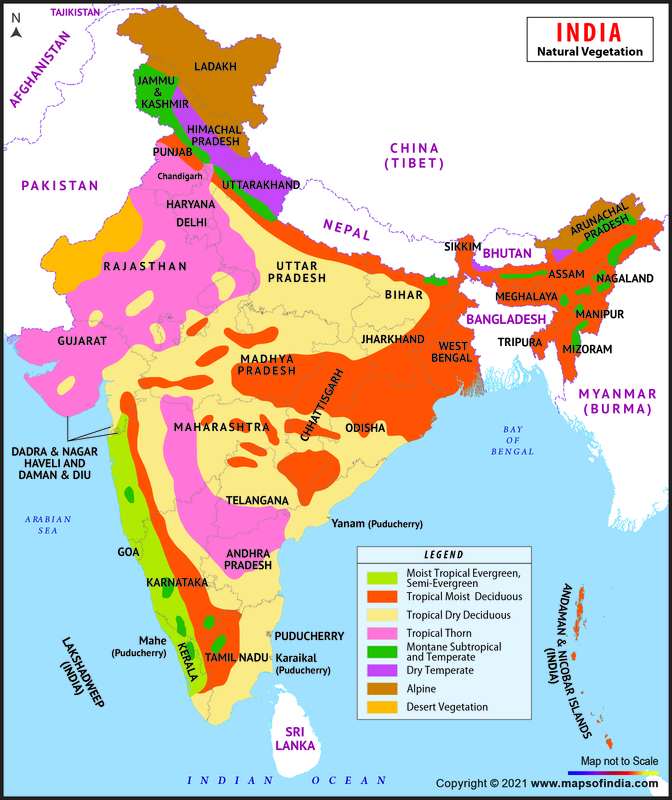 The climax formations of Indian subcontinent have been altered much due to human activities in the last few thousand years. However, the remaining vegetation shows that the natural vegetation of India primarily consists of forests. The grasslands found in the region are not natural plant formations but have originated secondarily due to destruction of natural forests in some places. Therefore, these represent various stages of seral (successional) development due to the influence of a variety of biotic influences. Source : Forest Survey of India, Dehradun. State of forest report 2001. Dehradun, FSI, 2002. 12p. The most important factors influencing the physiognomy, species composition, phenology etc. of Indian forests are temperature, rainfall, local edaphic and biotic factors. These factors have been used in the classification of Indian forests. Most detailed classification of Indian forests is by Champion and Seth (1967) in which 16 major types of forests have been recognized. These 16 major types can be grouped into 5 major categories viz. moist tropical, dry tropical, montane sub-tropical, temperate and alpine forests. These forests are found in the areas of quite high temperature and rainfall. The forests are dense, multi-layered and have many types of trees, shrubs and lians. These forests are further categorized into 4 types depending on the degree of wetness in the area and the dominant life form in the forest. These are climatic climax forests found commonly in areas having annual rainfall above 250 cm and temperature 25-30oC. These forests are chiefly distributed on the western face of Western Ghats, Assam, Cachar, parts of West Bengal, northern Canara, Annamalai Hills and Coorg in Meysore and Andman Islands. The characteristic feature of these forests is dense growth of very tall trees having height of more than 45 m. Climbers, lians, epiphytes and shrubs are abundant but herbs and grasses are rare in these forests. The carpet layer of herbs and grasses can not grow because very dense layer of leaf canopy of trees does not allow enough light to reach to the ground. Dominant trees in forests of west coast are Dipterocarpus indica, Palaquim and Cellenia while in forests of Assam Diptercarpus macrocarpus, D. turbinatus, Shorea assamica, Mesua ferrea and Kayea are the dominant trees. Common subdominants in these forests are Mangifera, Eugenia, Myristica, Pterospermum, Polyalthia, Elaeocarpus, Schlechera, Artocarpus, Memeocylon, Poeciloneuron, Cinnamomum, Diospyros, Sapindus, Vitex, Holigarna, Alstonia, Hardwickia, Spondias, Dendrocalamus, Calamus, Bombax, Veteria, Calophyllum, Pandanus, Cedrela, Tetrameles, Strobilanthes, Emblica, Michelia, Ixora, Hopea, Lagerstroemia, several species of ferns and orchids. These are also climatic climax forests found commonly in areas of annual rainfall 200-250 cm and temperature 25-32oC.These forests are chiefly distributed along the Western Ghats, in upper parts of Assam and Orissa and in Andman Islands. These forests are more developed in the northern India than in southern India. Characteristic feature of these forests is dense growth of evergreen trees intermixed with deciduous trees that shed their leaves for very brief period of relative dryness. Average height of trees in these forests is 25-35 m and shrubs are common. Forests have rich carpet layer of herbs, grasses ferns and orchids. Dominant trees in these forests are Dipterocarpus alatus, Hopea, Terminalia and Salmalia in Andman Island; Artocarpus, Micheliaand Mangifera in Orissa; Schima wallichii, Bauhinia, Phobe and Ammora in Assam. Common subdominants in these forests are Mylia, Schleichera, Bambusa, Ixora, Calamus, Sterculia, Webera, Strobilanthus, Cedrela, Shorea, Actinodaphne, Garcinia, Lagerstroemia, Mallotus, Vernonia, Dendrocalamus, Pelvetta, Elattaria, Pothos, Vitis, Garuga, Albizzia and Dellenia. Common herbs and grasses in the ground (carpet) layer are Inula, Andropogon, Crotolaria, Imperata, Leca, Desmodium, Fambosa and Woodfordia. These forests are found in the area having temperature of 25-30oC and quite high annual rainfall of 150-200 cm spread over most of the year but periods of rain alternating with very short periods of dryness. In several areas, the forests have been converted into open savannahs due to intensive biotic factors. These forests are chiefly distributed in a narrow belt along Himalayan foothills, on the eastern side of Western Ghats, Chota Nagpur, Khasi hills, in moist areas of Kerala, Karnataka, sothern Madhya Pradesh, parts of northern Uttar Pradesh, Bihar and West Bengal. Chief characteristic of these forests is dominance of deciduous trees that remain leafless for one or two months only along with lower story of smaller trees and evergreen shrubs. Dominant trees of these forests in north India are Tectona grandis, Shorea robusta, Salmella, and Dalbergia while in south India only Tectona grandis and Shorea sp. are dominant. Common subdominants in the forests are Cedrela, Albizzia, Terminalia, Adina, Melia, Sterculia, Grewia, Gariya, Lagerstroemia, Cordia, Pongamia, Bambusa, Dendrocalamus, Chloris, Mallotus, Anogeissus, heteropogon, Cymbopogon and Andropogon. These forests are found in wet marshy areas, in river deltas, in saline or other swampy areas and along the sea coasts. They are chiefly distributed in deltas of large rivers on the eastern coast and in pockets on the western coast (Tidal forests), in saline swamps of Sundarban in West Bengal, coastal areas of Andhra and Orissa (Mangrove forests) and in less saline or non-saline swampy pockets throughout the India. Chief characteristic of these forests is dominance of halophytic evergreen plants of varying height with varying density of plants in different area. Dominant plants of tidal and mangrove forests are Rhizophora, Bruguiera, Ceriops, Horitora, Avicennia, Nipa, Sonneratia and Acanthus. In less saline swamps, dominant plants are Ipomea, Phoenix, Phragmitis, Casuarina, Manilkara and Calophyllum. In other swamps, the dominant plants are Barringtonia, Syzygium, Myristica, Bischofia, Trowia, Lagerstroemia, Sophora, Pandanus, Entada and Premna. These forests are found in the areas where wet season is followed by a relatively long period of dryness during which trees remain leafless. These forests are dominated by smaller trees and shrubs and have abundance of shrubs or sometimes grasses. This category includes three types of forests. These forests are found in areas having temperature of 25-32oC and annual rainfall of 75-125 cm along with a dry season of about six months. Distribution of these forests in northern India is in areas of Punjab, Haryana, Uttar Pradesh, Bihar and Orissa. In the southern and central India, these forests are distributed in dry areas of Maharashtra, Tamilnadu, Karnataka and Madhya Pradesh. Chief characteristic feature of the forests is open canopy of small (10-15 m high) trees and abundance of shrubs. Dominant species of the forests in north India are Shorea robusta, anogeissus, Terminalia, Buchnnania, Somocarpus, Carissa, Emblica, Madhuca, Acacia, Aegle, Diospyros, Bauhinia, Eugenia, Zyzyphus, Lannea, Sterculia, Dendrocalamus, Salmelia, Adina, Grewia, Adathoda and Helicteres. In south India, dominant plants are Tectona grandis, Dalbergia, Kydia, Terminalia, Pterospermum, Dillenia, Acacia, Diospyros, Anogeissus, Boswellia, Bauhinia, Chloroxylon, Hardwickia, Soymida, Gymnosporia, Zyzyphus, Dendrocalamus and Holorrhena. Subdominant species in these forests are Bambusa, Lantana and grasses like Panicum, Andropogon and Heteropogon. These forests are found in the areas of high temperature of 27-30oC and very low annual rainfall of 20-60 cm with long periods of dryness. These forests are distributed in western Rajasthan, parts of Maharashtra, Madhya Pradesh and Tamilnadu. Chief charateristic of such forests is sparse distribution of small (8-10 m high) mostly thorny trees with shrubs being more common than trees. The plants in these forests remain leafless for most of the year. They develop leaves only during the brief rainy season when grasses and herbs also become abundant. Dominant plants in these forests are Acacia nilotica, A. leucophloea, A. senegal, Prosopis spicigera, P. juliflora, Albizzia and Capparis. Common subdominant plants are Zyzyphus, Anogeissus, Erythroxylon, Euphorbia, Cordia, Randia, Balanites, Salvadora, Gymnosporis, Leptadenia, Suaeda, Grewia, Gymnoma, Asparagus, Butea, Calotropis, Adathoda, Madhuca, Salmelia, Crotolaria, Tephrosia and Indigophera. These forests are found in the areas of relatively high temperature and small rainfall available only during summers. The forests are distributed in some parts of Tamilnadu and Karnataka. Chief characteristic features of the forests are dense distribution of mixed small evergreen and deciduous trees of 10-15 m height, absence of bamboos and abundance of grasses. Dominant plants in the forests are Memecylon, Maba, Pavetta, Foronia, Terminalia, Ixora, Sterculia, Mesua and Schleichora. These forests occur in the areas where climate is cooler than tropical but warmer than temperate areas i.e. on the hills between the altitudes of 1000 m and 2000 m. The forests are dominated by semi-xerophytic evergreen plants. This category includes three types of forests. These forests occur in relatively moist areas at lower altitudes on mountain ranges. Their chief distribution is in eastern Himalayas of West Bengal and Assam , hills of Khasi, Nilgiri and Mahabaleshwar. Chief characteristic feature of the forests is dense growth of evergreen browd-leaved trees with abundant growth of climbers and epiphytic ferns and orchids. Dominant trees in the forests of north are Quercus, Schima and Castanopsis with some temperate species. In the southern areas, dominants are Eugenia and members of family Lauraceae. Common co-dominants and subdominants in the eastern Himalayas are Dalbergia sissoo, Acacia, catachu, Sterospermum, Cedrela toona, Bauhinia, Anthocephalus cadamba, Lagerstroemia parviflora, Albizzia procera, Salmella, Artocarpus chaplasha and Dendrocalamus. In the western Himalayas, codominants and subdominants are Shorea robusta, Dalbergia sissoo, Cedrela toona, Ficus glomerulata, Eugenia jambolina, Acacia catachu, Butea monosperma, Carissa and Zizyphus. Other common plants in these forests of both north and south India are Actinodaphne, Randia, Glochidion, Terminalia, Olea, Eleagnus, Murraya, Atylosia, Ficus, Pittosporum, Saccopetalum, Carreya, Alnus, Betula, Phobe, Cedrela, Garcinia and Polulus. In the south, Mangifera and Canthium and climers like Piper trichostachyon, Gnetum scandens and Smilax macrophylla are also common. These forests occur in areas having quite low temperature and rainfall. The forests are distributed in the lower altitudes of eastern and western Himalayas. Chief characteristic feature of the forests is presence of thorny xerophytes and small-leaved evergreen plants. Dominant plants in the forests are Acacia modesta, Dodonea viscosa and Olea cuspidata. These forests occur at middle altitudes between 1500-2000 m in Himalayas. They are distributed in western Himalayas from Kashmir to Uttar Pradesh. In eastern Himalayas, the forests occur in Khasi Jayantia Hills of Assam. Chief characteristics of the forests in open formations of pine trees. Dominant trees in the forests are P. roxburghii and Pinus khasiana. These forests are found in the areas having quite low temperature along with comparatively high humidity than the comparable areas of higher latitudes. The cause of high humidity is greater rainfall in Himalayas except in parts of Uttar Pradesh, Punjab, Himachal Pradesh and Kashmir where humidity is lower. The forests occur mainly in the Himalayas at altitudes 2000-4000 m. The forests are generally dominated by tall conifers or angiospermic evergreen trees with abundance of epiphytic mosses, lichens and ferns. The category includes three types of forests. These forests are found at altitudes of 1800-3000 m in the cooler and humid mountains. They are distributed in the eastern Himalayas from eastern Nepal to Assam, in the western Himalayas from Kashmir to western Nepal and in Nilgiri Hills of south Indian. Chief characteristic feature of the forests in the Himalayas is dense formation of evergreen, semievergreen broad-leaved and coniferous trees of up to 25 m height. In south India, these forests are termed Shola forests and mostly have 15-20 m high broad-leaved trees with dense leaf canopy, abundant epiphytic flora and rich herbaceous undergrowth. Dominant trees in the forests of western Himalayas are angiosperms like Quercus, Betula, Acer, Ulmus, Populus, Corylus, Caprinus etc. and conifers like Abies, Picea, Cedrus etc. In eastern Himalayas, dominants are Quercus, Acer, Prunus, Ulmus, Eurya, Machilus, Symplocos, Mahonia, Begonia, Michelia, Thunbergia, Rhododendron, Arundinaria, Bucklandia, Pittosporum, Loranthus, Tsug and, Abies. In the Nilgiri Hills, the dominants are Rhododendron nilagiricum, Hopea, Balanocarpus, Artocarpus, Artocarpus, Elaeocarpus, Pterocarpus, Hardwickia, Myristica, Cordonia, Salmalia, Mucuna and Dioscorea. In all the areas, the undergrowth is formed by members of Asteraceae, Rubiaceae, Acanthaceae and Fabaceae. These forests are found at 1700-3500 m altitude in eastern and western Himalayas. These occur in areas having annual rainfall above 100 cm but relatively less than that in areas of wet temperate forests. Chief characteristic feature of the forests is presence of tall (up to 45 m high) conifers, oaks or their mixture along with thin partly deciduous undergrowth. Dominant trees in the eastern Himalayas are Tsuga dumosa, Quercus lineata, Picea spinulosa, Abies densa and Quercus pachyphylla. In the western Himalayas, dominants in lower zones are Quercus incana, . dialata, Cedrus deodara, Pinus wallichiana, Picea smithiana, Abies pindrew, Cotoneaster, Berberis and Spire while in the higher zones the dominants are Quercus semicarpifolia and Abies pindrew. These forests occur in the regions of Himalayas having very low rainfall. They are distributed in both eastern and western Himalayas. Chief characteristic feature of the forests is dominance of evergreen oaks and conifers. Undergrowth is formed by scrubs. Dominant trees in the forests of comparatively drier western Himalayas are Pinus gerardiana and Quercus ilex. In the comparatively wetter western Himalayan region, the dominants are Abies, Picea, Larix griffithia and Juniperus wallichiana. Subdominant plants in these forests are Daphne, Artemesia, Fraxinus, Alnus, Cannabis and Plectranthus. These forests are found in the regions of Himalayas having extremely low temperature and humidity. The forests are dominated by perennial and annual herbs and grasses though some trees may also be present in areas of relatively high humidity. Abundant lichen flora is characteristic feature of these forests. This category includes three types of forests. These forests are found in open strands throughout the Himalayas between the altitude 3500 m and the tree tine. Chief characteristic feature of the forests is presence of some evergreen conifers and broad-leaved trees along with prominent shrub layer. Dominant trees in the forests are Abies spectabilis, Rhododendron and Betula. Prominent shrubs in the forests are Cotoneaster, Rosa, Smilax, Lonicera and Strobilanthus. These forests are found in the Himalayas above the tree line up to 5500 m altitude in somewhat moist areas. Chief characteristic feature of the forests is dominance of dwarf, evergreen shrubby conifers and broad-leaved trees along with prominent shrub layer under them. Dominant trees in the forests are Juniperus and Rhododendron while prominent shrubs are Thalictrum, Lonicera, Saxifraga, Arenaria, Bergia, Sedum and Primula. These forests are found in comparatively more dry areas of Himalayas upto 5500 m altitude. Chief characteristic feature of the forests is open formation of xerophytic scrubs with many herbs and grasses. Dominant plants in the forests are Juniperus, Caragana, Eurctia, Salix and Myricaria. The grasslands of India are not of primary origin. These have originated secondarily in many areas due to destruction of natural forests by biotic interference, particularly due to excessive grazing and land clearing for agriculture. These grasslands are maintained in various seral (successional) stages by a variety of biotic factors. According to the dryness of the area, the Indian grasslands may be categorized into three types. Xerophilous grasslands: These are found in semi-desert areas of north and west India. Mesophilous grasslands (Savannahas): These are found in areas of Uttar Pradesh having moist deciduous forests. Hygrophilous grasslands (Wet savannahas): These are found in wet regions of India. Whyte et al. (1954) classified Indian grasslands on the basis of dominant grass species into eight major grass associations. These grasslands develop on black soil. They are found in some areas of Maharashtra, Madhya Pradesh, Uttar Pradesh, south western Uttar Pradesh, Tamilnadu and Karnataka. Dominant grass species in the grasslands are Sehima sulcatum, S. nervosum, Dichanthium annulatum, Chrysopogon montanus and Themeda quadrivalvia. These grasslands develop on sandy-loam soils. They are found in Plains of Punjab, Haryana, Delhi, Rajasthan, Saurashtra, eastern Uttar Pradesh, Bihar, West Bengal, eastern Madhya Pradesh, coastal Maharashtra and Tamilnadu. Dominant species in these grasslands are Dichanthium annulatum and Cenchrus ciliaris. These grasslands develop in marshy areas. They are found in terai regions of northern Uttar Pradesh, Bihar, West Bengal, Sundarban region of Bengal, Tamilnadu, and Kaveri delta. Dominant species in these grasslands are Phragmitis karka,, Saccharum spontaneum, Imeerata cylindrica and Bothriochlo pertusa. These grasslands develop on low hills. They are found in Eastern Ghats, Vidhyas, Satpura, Aravali and Chota Nagpur. Dominant species in the grasslands is Cymbopogon. These grasslands develop on high hills. They are found in Western Ghats, Nilgiris and lower Himalayas from Assam to Kashmir. Dominant species in the grasslands are Arundinella nepalensis, A. setosa and Themeda anthera. These grasslands develop on paddy tracts in areas of heavey rainfall in Lonavala tract of Maharashtra. Dominant species in the grasslands is Bothriochloa odorata. These grasslands develop in temperate areas of upper Himalayas between 2100-3500 m altitudes. Dominant species in the grasslands are Deyeuxia, Arundinella, Brachypodium, Bromus and Festuca. These grasslands develop in temperate to alpine regions having thin soil cover over rocky substratum. They are found in Kashmir and in Himalayas above 2600 m altitude. Dominant species in the grasslands are Deyeuxia, Deschampsia, Poa, Stipa, Glycera and Festuca.